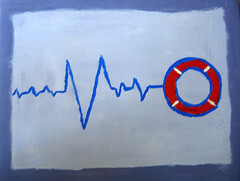 Throw a lifeline to your future. It can be pretty discouraging when after a long week of hard work you realize you are not one inch closer to the future you want. Sure, you’ve worked all out, chopping through tasks left, right and center, fulfilling all your (conflicting) roles for various people in your life, and here it Friday, your brain feels like boiled mush and you’re bone tired. What’s worse, you know in your heart of hearts (or Weekly Review) that nothing you’ve done this week is connected to who you want to be, what you really want to achieve, what you really, really, really want your future to look like. There was just too much stuff from now to deal with – too many looming deadlines, urgent requests, upcoming milestones, all those web sites and emails and decisions, choices, alternatives and options. Not to mention all the past stuff – things you wish you had done better, things you wished you’d not done at all. At least, that was my week – how about you? Now before the suicide hotlines and liquor stores start seeing a surge in business, I’d like to suggest there’s a solution to this very discouraging problem. It’s simple, but not easy: Throw a lifeline to your future. The purpose of a lifeline is to pull someone from where they don’t want to be – quicksand pit, raging seas, icy pond, the messy present – to where they want to be. In the movies, the brave and valiant rescuers provide the muscle to pull the limp victim to safety; this isn’t the movies. It’s going to be up to you, buckwheat, to throw that lifeline, hook it onto something solid and start pulling with all your might if you want to get into that really nice future. Know what future you want. So what do you really want? Look in your heart of hearts for that really big thing you want. Maybe it’s making a million bucks a month, or fulfilling your lifelong ambition, or finding The Right Girl or The Right Guy. Be honest – there’s only you and me here – and I won’t talk. Now write it down where only you will see it. That’s the big beautiful future you want to get your lifeline around so you can pull yourself to it. Refer to it often. Look at it when you go to sleep, look at it when you wake up. Let go of your luggage. That’s right, stick all the emails decaying in your inbox into a new folder, move all the hundreds of documents littering your desktop and My Documents folder to a new folder, drag all those bookmarks and favorites you just had to mark to a new folder, delete all your saved voicemails, bag every task lingering on your to do list older than a week. Heresy! Blasphemy! Nope: Reality. If you want to get to the future you’ve got to let go of the past, and besides, to be brutally honest, what are the chances you are going to deal with all those dead open loops? Slim to none. Lighten your load. So let go. Know that if other people have done it, you can do it. Go visit a bookstore or library’s biography section – find someone you like, that you admire. Get that book and read it. Odds are good it’s going to be a recounting of someone who had it worse that you, who struggled like hell to pull themselves to the life they wanted, the things they believed in. If they did it, so can you. Not convinced? Go buy or check out another biography. Every single day, do one tiny doable thing to make that future happen, and do it the very first thing. You want to write a bestselling novel? Spend 30 minutes a day writing the very first thing you do. Want to run the company you work for? Do one tiny step to towards that future before you do the rest of you job. Want to write a great app you can be proud of? Spend the first 30 minutes learning what you have to learn and doing what you have to do to make that happen. What about all the things you’re supposed to do? They can wait for all of 30 minutes while you do some tiny, but constructive, step for you. This last one – doing one tiny thing to make the future you want happen, and doing it first before all the now stuff, is your lifeline to the future. Grab it!